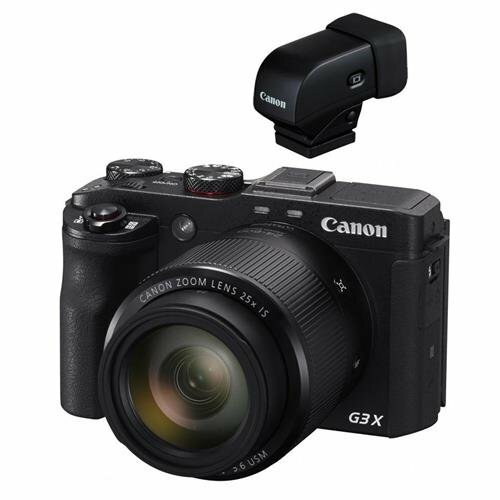 Reach out and capture distant scenes and subjects without compromise thanks to the large 20.2-megapixel 1.0″ High-Sensitivity CMOS sensor and 25x optical zoom lens present on the PowerShot G3 X Digital Camera from Canon. The Canon lens offers a fast maximum aperture range of f/2.8-5.6 for operation in a range of conditions while the zoom range extends from a wide angle 24mm equivalent to a super telephoto 600mm equivalent. Also, operating at odd angles, or when taking a selfie, is benefitted by the inclusion of a 3.2″ 1.62m-dot multi-angle tilting touchscreen LCD. When combining the High-Sensitivity Sensor with the DIGIC 6 processor, the Canon HS System is created, providing excellent low-light performance up to ISO 12,800 as well as a plethora of other capabilities. Continuous shooting at up to 5.9 fps is possible with no buffer time to slow you down, and the High-Speed AF System will lock focus in as fast as 0.14 seconds. Focusing is also accurate through the implementation of 31 points across the frame. Another feature of this combo is Full HD video recording at up to 60p and the ability to output the video live over an HDMI cable.